Donna Douglas was a real-life tomboy before she arrived in Hollywood and played animal-loving, beautiful tomboy Elly May Clampett on The Beverly Hillbillies. Doris Ione Smith was born on September 26, 1932 in Pride, Louisiana. An older Donna Douglas confessed to the Ames Tribune in a 2014 interview that she was a lot like her Elly May Clampett character on The Beverly Hillbillies, in her early years in Louisiana. "Elly was a slice out of my life...I was raised a tomboy with one older brother and all male cousins. So I grew up swinging from vines and playing softball. I was getting ready for Jethro long before we ever met." Young Doris (or Dorothy, according to some sources) was only 17 when she married Roland Bourgeois Jr. in 1949. The couple lived with her parents during their entire marriage. Their son Danny P. Bourgeois was born in 1954, the year they divorced. Despite her youthful tomboy leanings, Douglas' obvious outward youthful physical beauty had matured with marriage and motherhood. She won some local beauty pageants (Miss New Orleans 1957), then moved to New York City to pursue a modeling and acting career. By the time she was the "Letters Girl" on Perry Como's Kraft Music Hall variety series in 1957, and "Billboard Girl" on The Steve Allen Plymouth Show from 1959-1960, she'd taken the name of Donna Douglas. Douglas had a small role with Mike Connors on his early TV crime drama series Tightrope (before he became known for Mannix), but it was an appearance on The Ed Sullivan Show that caught the eye of legendary Hollywood movie producer Hal B. Wallis. Douglas was soon signed to a movie contract by Wallis. Other early films Donna Douglas included a bit part in the popular musical comedy film Li'l Abner (1959) as a chorus girl. The Li'l Abner cast featured Julie Newmar, Stella Stevens, Valerie Harper (Rhoda on The Mary Tyler Moore Show), and Jerry Lewis. In the rom-com Lover Come Back (1961) starring Rock Hudson, Doris Day, Tony Randall (Felix Unger on The Odd Couple), and Ann B. Davis (Alice the maid on The Brady Bunch), Donna Douglas had a slightly larger role as a a secretary. 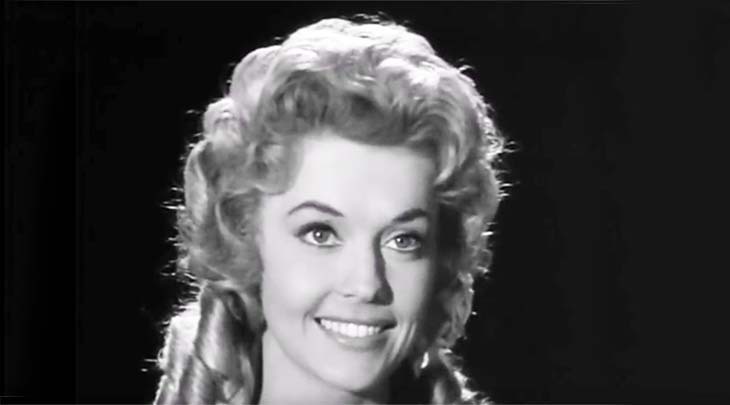 Although best known for her work as Elly May on the The Beverly Hillbillies from 1962-1971, Donna Douglas kept busy on television throughout the 1960s. Douglas can be seen in 3 episodes of the popular comedy series Mister Ed, including the "Clint Eastwood Meets Mister Ed" episode. She appeared in an episode of Bachelor Father with series regulars John Forsythe, Noreen Corcoran, and Sammee Tong. In "The Hungry Glass" 1961 episode of Boris Karloff's Thriller, Donna Douglas guest-starred as beautiful young Laura Bellman, entranced and trapped by her mirror. Fellow guest stars in the episode include William Shatner as Gil Thrasher, Joanna Heyes as his wife Marcia, Russell Johnson and Elizabeth Allen as their friends Adam and Liz Talmadge. Below, "The Hungry Glass" episode of Thriller, featuring Donna Douglas, William Shatner, and Russell Johnson. The Twilight Zone, in an episode with Carol Burnett. The Defenders, and in an episode of Mister Ed starring Clint Eastwood. Route 66 with Martin Milner and George Maharis. 77 Sunset Strip with Edd Byrnes, Roger Smith and Richard Long. Hennesey starring Jackie Cooper, with Abby Dalton. The Aquanauts, in episodes with Burt Reynolds, and Ron Ely (Tarzan). Cain's Hundred, starring Peter Mark Richman. Surfside 6, in two episodes that had Joan O'Brien, Van Williams, and Troy Donahue. Dr. Kildare, starring Richard Chamberlain, in an episode with Harvey Korman and her The Beverly Hillbillies co-star Nancy Kulp. The role that Donna Douglas will be remembered most for is that of the beautiful, innocent, animal loving Elly May Clampett. She played actor Buddy Ebsen's (Jed Clampett) daughter, granddaughter of actress Irene Ryan (Granny), and cousin of Max Baer Jr. (Jethro Bodine). Douglas has said it's been estimated that she worked with over 500 animals on the set of The Beverly Hillbillies during it's 9-year run on the air. Buddy Ebsen and Donna Douglas maintained a close life-long friendship off-screen after the end of the series in 1971. Douglas said in interviews that Ebsen reminded her strongly of her father, and was a wonderful man. Below, the Pygmalion and Elly (1962) episode of The Beverly Hillbillies features Donna Douglas as Elly May and actor Louis Nye as her fanciful suitor Sonny Drysdale (son of their bank manager & neighbor Mr. Milburn Drysdale on the series). 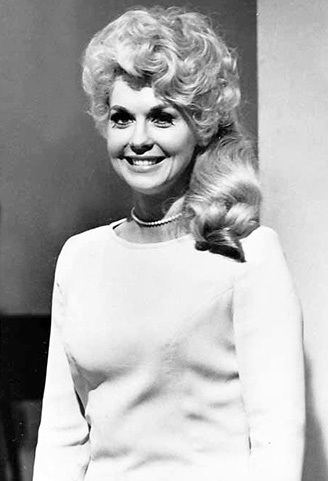 Donna Douglas reprised her role as Elly Mae Clampett for the TV movie The Return of the Beverly Hillbillies (1981), along with fellow original series cast members Buddy Ebsen, and Nancy Kulp. 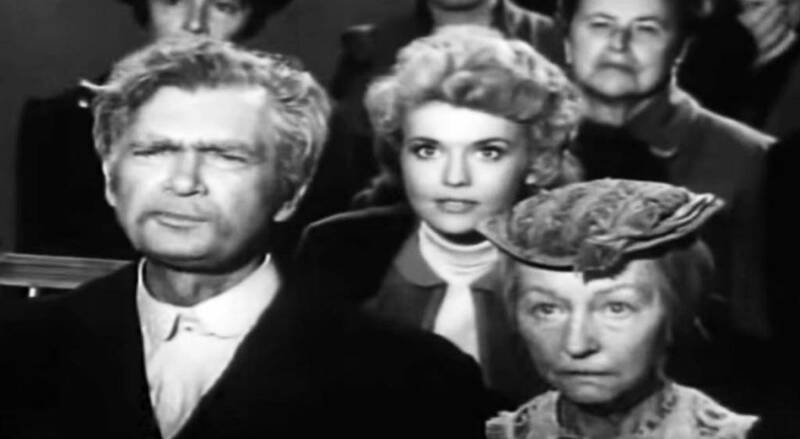 Future TV star Heather Locklear had an uncredited role in The Return of the Beverly Hillbillies. Hal Wallis produced many Elvis Presley movies, and Douglas starred alongside the legendary Elvis on the big screen in Frankie and Johnny (1966). 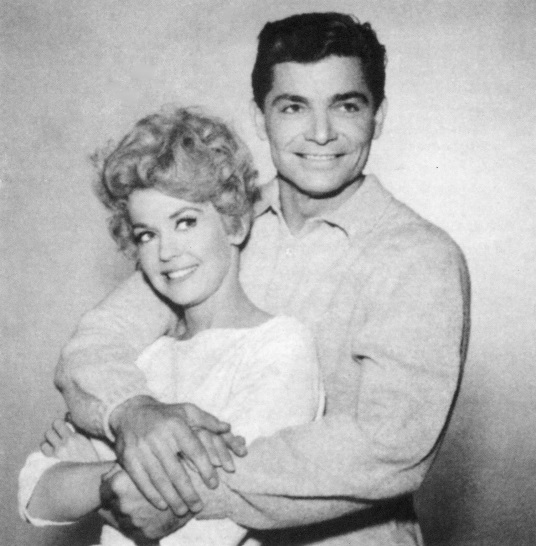 Their co-stars in Frankie and Johnny included Sue Ann Langdon and Nancy Kovack. Below, the movie trailer for Frankie and Johnny features Elvis Presley, Donna Douglas, Harry Morgan, Nancy Kovack, and Sue Ann Langdon. She married second husband Robert M. Leeds in 1971; Leeds was a director on The Beverly Hillbillies. They divorced in 1980. Donna Douglas' acting career had begun petering out after The Beverly Hilbillies went off the air in 1971, but sharp-eyed baby boomers may remember seeing her in guest-starring roles on 1970's series like Project U.F.O., and Adam-12 starring Martin Milner and Kent McCord. She guest-starred on Rock Hudson's 1970s light police detective series McMillan & Wife, co-starring Susan Saint James and John Shuck. Douglas became a gospel and country music recording artist and performer in the 1970's and 1980's. In her senior years, she made a rare onscreen appearance in 1999, guest-starring with Hal Linden on an episode of The Nanny starring Fran Drescher, Charles Shaughnessy, and Nicholle Tom. Donna Douglas turned to writing Christian-themed children's books. At the age of 78 in 2011, she released a new children's book titled Miss Donna's Mulberry Acres Farm. In 2013, her cookbook, Southern Favorites with a Taste of Hollywood, featured recipes from her many celebrity friends. Donna Douglas died on January 1, 2015 from pancreatic cancer at the age of 82 in Louisiana (the same state she was born in, in 1933). She was a great-grandmother thanks to her son Danny Bourgeois, his children and grandchildren. 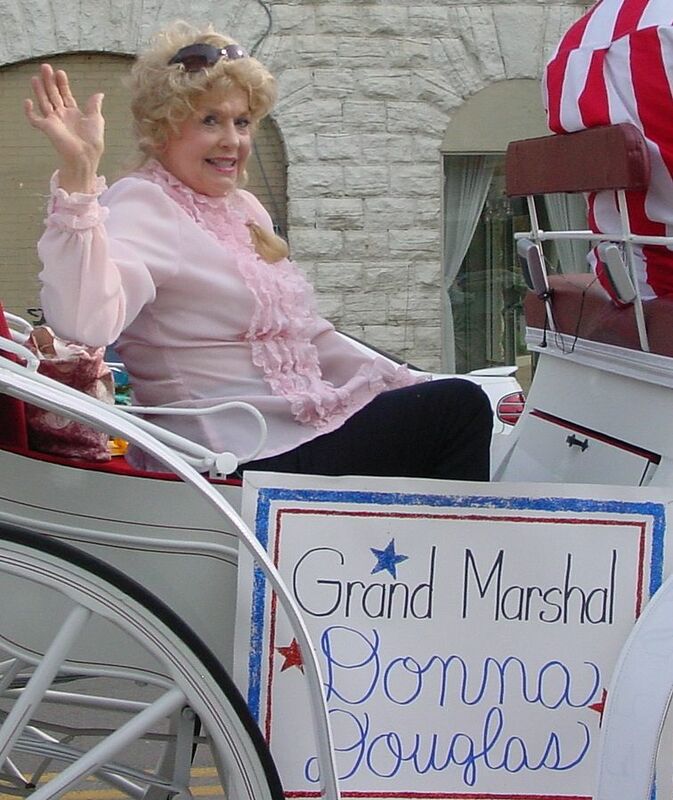 Note: This article was first published in January, 2015 with the title Farewell Donna Douglas. It has been updated with new & additional content.